once upon a time there was a guy with a beard. there is. 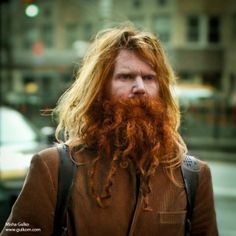 a red beard. yes. let’s make it red. dark red and lustrous. and the beard had braids. two of them. long but no so long it was weird. well, actually this is already sort of weird. but here he is! right in front of me across the room, talking to a woman wearing purple who is talking about cats and a friend of hers who tried to call the cat whisperer but he wouldn’t come and so she had to make that choice — that hard choice to either live with the cat who scratches everyone even when they were oven mitts to pet it and ignore her other responsibilities OR to give the cat away. the guy with the beard puts his orange (!) baseball cap on and nods; he is listening, he isn’t saying much, but when you have a beard like that what can you say? what is necessary to impart other than your general awesomeness — your oldschool newschool posthippy post hillbilly something or other that you have going on here? another woman who is wearing green is talking about customers, and now i’m craning my neck trying to hear what they are talking about, but the man with the beard stands up and i feel sad that i will never get to know him. then he walks by me and it’s a big disappointment. he’s not tall or burly, and he has a pony tail, which is sort of thin and wispy — not lustrous like the beard, and the woman in green says it was nice to meet you, and away they go and this story feels pretty bathetic and pathetic ending in this wispy ponytail hanging out the back sort of way, so i’m going to return to the first time i saw the beard, with its twin braids full of promise, their rubber bands — not hair bands, those flesh colored rubber bands like you see at the post office or Office Depot or wrapped around those dumb coupon newspapers that come in the mail — wound tight around them. beckoning some mystery having to do with hair and redness and a bristle of adventure.